Sealaska Heritage Institute (SHI) this week will release a new culturally-based children’s book through its award-winning Baby Raven Reads program. The new book, How Devil's Club Came to Be, is an original story inspired by ancient oral traditions that have been handed down through the generations. It tells the story of Raven’s niece who sets off to save her village after a giant kidnaps her village’s shaman and leaves her people ailing. Along the way, she meets the Thunderbird People and is transformed into a Thunderbird. In this form, she fights the giant and discovers Devil’s Club, a plant common in Southeast Alaska that is considered sacred for its medicinal properties. The story was written by Tlingit author Miranda Rose Kaagwéil Worl and illustrated by Tlingit artist Michaela Goade. Worl wrote the story when she was a freshman in high school and submitted it to SHI through its Yées kashxeedí (New/young/fresh writer) program. This is her first children’s book. Goade has illustrated two other Baby Raven titles for SHI: Let's Go! and Salmon Boy: Shanyáak'utlaax. SHI will release the book this Friday, Dec. 1, from 4:30-6 pm at the Walter Soboleff Building in Juneau during Gallery Walk. Worl and Goade will be on hand to sign books and Education Program Manager Katrina Hotch will read from SHI’s Baby Raven books. Everyone is invited. 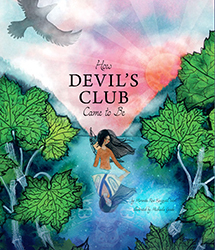 How Devil's Club Came to Be is the nineteenth children’s book published through SHI’s Baby Raven Reads, a program for Alaska Native families with children up to age 5 that promotes early literacy, language development and school readiness. Baby Raven Reads was one of 15 programs in the world chosen for a 2017 Library of Congress Literacy Awards Program Best Practice Honoree award. In 2017, SHI received a grant from the Alaska Native Education Program to expand Baby Raven Reads to nine other communities. SHI—in partnership with Central Council of Tlingit and Haida Indian Tribes of Alaska (CCTHITA) Head Start program—will offer the three-year program in Juneau, Angoon, Craig, Hoonah, Klawock, Petersburg, Saxman, Sitka, Wrangell and Yakutat through 2020. SHI is currently enrolling participants and recruiting community liaisons. Baby Raven Reads books are available through the Sealaska Heritage Store in downtown Juneau and online.